After a very rainy and dismal Summer, we’re now looking at chilly mornings and nights returning, so why not curl up in the warm and turn on the radio to listen to your favourite programme? After all, it’s better than the reality contest rubbish that assails our senses on the Box isn’t it? I find the sound is made so much warmer, making me feel even more cosy, when the programme emanates from a good, old fashioned vintage radio. It’s the valves, I think. They just make everything seem so much better than bland old circuitry. Or may be I’m an old nostalgic at heart. I’m almost reaching for the buttered, toasted crumpets as I type! Personally speaking, I listen to an EKCO model M23, designed in 1932, that I bought at auction in Somerset. Its clean-lined, modern architectural shape reminded me of an Art Deco building. And it’s precisely this that interests collectors the most. It’s actually not the sound (lovely as it is! ), but the case that matters. The more stylish and evocative of the period the design is, the more desirable it is likely to be. 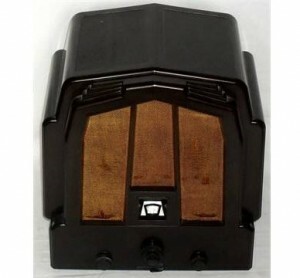 My radio was made around 1931, so fits in to the time period when the plastic radio boomed in popularity. Developments in plastics during the 1920s and 1930s saw all manner of shapes and colours being produced, allowing the radio to break out from the dull dominance of cases built like the wooden furniture of the Edwardian period and unappealing ‘build it yourself’ crystal kit boxes with wires. Bakelite and similar early plastics were easy to mould into all sorts of shapes, often in a rainbow of plastic colours, although some were still put into wooden or veneer cases to attract traditionalists. EKCO (short for the maker’s name ‘E.K. Cole’) was one of Britain’s most revered radio companies. They were responsible for the unique and innovative ‘Round’ EKCO, which was designed by British architect Wells Coates and made in five different variations. Values today vary from around £500 to over £1,000 depending on the model as some designs, such as the first AD65 of 1934, are more popular than others. Most were made in plain or mottled brown bakelite, but examples are also found in Deco black and chrome and these tend to fetch a premium. Also look out for blue, green or other coloured examples. Exceptionally rare to the point of being legendary, prices go stratospheric, although the few examples I’ve seen over the years look as though they were sold (and even made) by Del Boy from the Trotter stall! Another solid British name to look out for is Philips, who made radios from both bakelite and a mysterious laminated wood known as ‘Arbolite’. Those with Art Deco styled grilles are particularly appealing and can fetch anything from £200-500. Kolster Brandes (known as ‘KB’) made a fun little radio known as ‘the toaster’, for obvious visual reasons. In plain, sprayed on colours, they can be found for around £50-80, more for wild ‘solid’ colours or combinations of colours. A great start to a collection is the chunky 1950s Bush DAC90, the doyen of many an antiques centre, which can be found for anything from £20 upwards. Now I said ‘old fashioned’ when I introduced my article, but many vintage radios were and still are far from it – even more so than the round EKCO. In fact during their day, they were the height of fashionable, avant garde interior decor. The country that did it best was undoubtedly the US. The name FADA instantly springs to mind, particularly its famous ‘Bullet’. Shaped like a gumdrop, its streamlined shape shouts late American Art Deco of the early 40s. 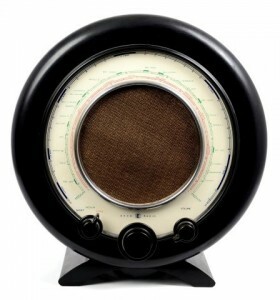 Made in a variety of bright colours, it became one of the most popular radios ever made. The colour was down to the choice of material, a cast phenolic plastic often known as ‘Catalin’ after the American company that made the material. Cheery cherry reds, yellows and strong cobalt blues abound, but look out for the ‘All American’ produced when the US entered WWII with its patriotic combination of red, white and blue. This can fetch over £2,000 in great condition, whilst others can fetch around £500-700 upwards. Other names to look out for include the desirable skyscraper-like Air King, designed by the notable Harold van Doren, Motorola, Addison and Bendix for their funky colours and louvres or grilles, and Emerson for its radios aptly nicknamed ‘tombstones’. A rare baby blue Air King ‘Skyscraper’ fetched over $50,000 at auction a while ago, but in general prices vary from around £500 to around £3,000. So keep your eyes peeled at a relative’s house and at local fairs and auctions where they may not be recognised. If the 50s are more your thing, look out for the Philco ‘Boomerang’ or a Crosley ‘Bullseye’ as nothing beats them in getting the look of the day. Colour is important to value, with vibrant blues, greens and cherry reds usually being more sought after and valuable than yellows, browns or beiges. Great combinations of colours, such as between the body and grille, are also desirable. On that note, it’s also worth pointing out that many of the ‘butterscotch’ yellow radios weren’t made like that. They began as an attractive ivory colour, but discoloured over the years to ‘chicken tikka masala’ yellow. Polishing can remove these signs of ages, but this is best done by a professional. This brings me on to another thing best done by a professional – restoration. Never, ever plug a new purchase in to the mains to see if it works, no matter how excited you are. Always get it checked out by a qualified electrician or vintage radio restorer first. Whilst the collecting arena is hot with spares and information on how to restore your radio yourself, it will take time and it’s best to seek advice if you are a newcomer, preferably from a club or society. One last thing before I move to the future. When buying, inspect the body carefully for damage such as burns, warping, cracks, chips or even restored cracks and chips as this affects value. Run your fingers all over to check to uneven areas. Original card backs and grille cloths are good to look for. However, if you find torn cloths or (worse) a bit of granny’s old curtains, suitable replacements can usually be found. Looking to the future, look to the 70s. I’m fond of the Panasonic ‘Panapet’, which is worth double with its box, and the funksome Panasonic ‘Tootaloop’, available in a variety of colours, with lime green, mauve and lilac being rarer than, say, yellow. This uniquely styled, swivelling radio was designed to be portable and worn around the wrist. Hmmmm. You know what, I think I’ll stick to my iPod and leave the vintage radios for home!